Evelyn Tiffany-Castiglioni is a professor in the College of Veterinary Medicine and Biomedical Sciences at Texas A&M University. She received a B.S. degree in Biology from the University of Texas-El Paso. She also received a Ph.D. in Human Genetics and Cell Biology from the University of Texas Medical Branch Graduate School of Biomedical Sciences (UTMB GSBS). She also received the Texas A&M University Former Students Association Distinguished Faculty Award for Research in 1998 and the Distinguished Alumnus Award from UTMB GSBS in 2002. She currently serves on the editorial board of the International Journal of Developmental Neuroscience and is an associate editor for Neurotoxicology. Evelyn studied concert accordion with her father, Robert S. Tiffany, Jr. (a former student of Frank Gaviani Snr. and teacher of the Frank Gaviani Accordion School), and classical pedal harp with Gayel Panke Gibson at the University of Texas at El Paso and Laurie Buchanan at the University of Texas at San Antonio. 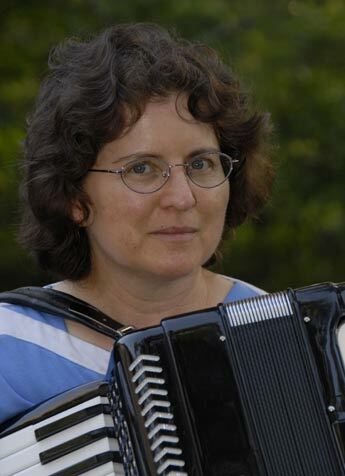 She is an accordionist with the Texas-based contra dance band "Jalapeño Honey." She was also named 'Harper of the Day' at the Texas Scottish Festival Highland Games, the Ohio Scottish Games in 2004 and the Stone Mountain Highland Games (Nationals) in 2005. She has published numerous harp arrangements of traditional tunes with Afghan Press (Houston, Texas). Evelyn is not related to the Castiglione Accordion family, except that she has played their wonderful accordions for most of her life. However, Frank and Mary Gaviani were her godparents.